Other than the 15 minutes of sunshine we all need for our daily requirement of vitamin D, staying out of the sun should always be the first choice for skin cancer prevention. However, there are ways to reduce the damage your skin gets from the sun. Wearing protective clothing, hats, and limiting sun exposure during the sunniest parts of the day are all great ideas. When sun exposure can’t be avoided, however, sunscreen can also help protect from some of the damaging effects of the sun. But what kind of sunscreen is best? Spray or lotion? SPF 15 or SPF 70? Waterproof or moisturizing? It seems like new rules come out every year. 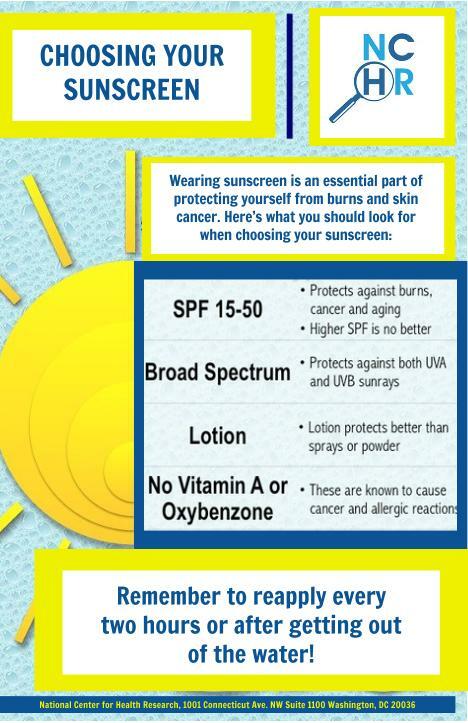 To clear up mixed messages, here is a guide to choosing the best sunscreen for you and your family. Spending too much time in the sun puts you at risk for skin cancer. There are three types of skin cancer: basal cell, squamous cell, and melanoma. Basal cell cancers, the most common, are slow growing and are the easiest to treat. Squamous cell cancers detected at an early stage are curable and cause minimal damage. Melanoma is the least common but most dangerous kind of skin cancer. If not caught early, it can spread throughout the body and become fatal. Protecting your kids from sunburns is especially important. Getting sunburns during childhood increases the risk of cancer later in life.1 So get your kids into the routine of applying sunscreen every morning (after they brush their teeth) before going to school or to camp, no matter how cloudy it is outside. Sun protection factor (SPF) choices range from SPF 8 all the way up to SPF 100+. According to the Food and Drug Administration (FDA), SPFs below 15 protect against sunburns, but they do not prevent damage that can cause skin cancer.6 On the other hand, very high SPFs are misleading since SPF 30 protects against 97% of UV rays, SPF 50 protects against 98%, and SPF 100 protects against 99%. Sunscreens with the highest SPFs cost more and provide little additional protection, and they also encourage people to stay out in the sun longer and reapply less frequently. For effective sun protection, look for an SPF between 15 and 50. In addition, make sure to choose “broad-spectrum” sunscreen, which guards against both UVB and UVA rays. While only 10% of UV radiation from the sun is UVB, this type of radiation is the primary cause of sunburns, wrinkling, and skin cancer.1 UVA rays penetrate deep into the skin to cause premature aging, and with enough exposure can also damage DNA to cause cancer. You may be surprised to learn that the FDA does not check the ingredients in sunscreens to test if they are safe and effective. Many of the active ingredients in sunscreens have been used for so long that they are generally believed to be safe and effective, but that is different from being proven to actually be safe and effective. The FDA is currently working on a plan to start testing sunscreen ingredients for safety and effectiveness. Consumer Reports rated the effectiveness of sunscreens but not their safety. This is the list of the top sunscreen lotions and sticks from their 2016 report. However, all of them are made with endocrine disrupting chemicals. The sunscreens that are made with the safer ingredients (zinc oxide and titanium dioxide) scored very poorly in the Consumer Reports report. LOTION OR SPRAY? WATERPROOF OR WATER-RESISTANT? Avoid powder makeup and instead use liquid makeup products that contain SPF. Loose powders contain zinc and titanium that can be carcinogenic if inhaled.7 For this reason, the FDA no longer allows the manufacture of powder make-up with SPF, but some of these products are still on the market. In addition, be sure to avoid sunscreen sprays, especially for kids. Sprays make it easy to inhale the chemicals that are found in the sunscreens. This can pose a safety issue, especially for small children who tend to squirm a lot while sunscreen is put on them. The FDA has also expressed concern about sprays but has not yet limited their use.8 Sunscreen lotion provides better protection against burns that cause skin cancer and aging, without the risk of inhaling dangerous chemicals. If a spray sunscreen is the only available option, first spray it in your hands before applying it to children. Do the same before applying it to the face of adults. Waterproof sunscreens are no longer for sale. The FDA issued new guidelines that sunscreens can only be labeled as “water resistant” and must say whether they protect for 40 or 80 minutes while sweating or swimming.7 So be sure to reapply your water resistant sunscreen right after getting out of the water. So what should you do to prevent sunburns, aging, and skin cancer? Apply a generous amount of SPF 15 – 50 sunscreen lotion every morning, wear a hat and sunglasses, and generally try to stay in the shade. Reapply your sunscreen after extended sun exposure, sweating, and swimming. Always check the expiration date on sunscreens before you buy and use them, and stay away from tanning beds and sun lamps. If you are fair-skinned or have a family history of skin cancer, be extra careful. Every year, the Environmental Working Group researches sunscreens on the market and rates them for safety and how well they work. To see how your sunscreen compares, visit their website. If your sunscreen is poorly rated, you can browse their site to find good alternatives.